The combination of baking soda (sodium bicarbonate) and lemon water/juice has been making its rounds online as the next big thing. The potential benefits are said to include everything from detoxing the body, increasing nutrient absorption, aiding digestion, and assisting with fat loss to even being a potential cure for cancer. Sodium bicarbonate is good at neutralizing acidic conditions inside and outside your body; it is said to help relieve heartburn and even make your skin and hair appear more youthful. Lemon juice also has an alkalizing effect and is a great source of the antioxidant vitamin C and phytochemicals called limonoids (research shows they possess significant anticancer activity). Keep in mind that consuming a baking soda-lemon drink to treat cancer requires much more exploration, although some sources indicate such studies are underway. That being said, because of its neutralizing and alkalizing effects, lemon juice and sodium bicarbonate are said to help with a number of health conditions. There is some belief that when your body becomes acidic it is more prone to illness, infection, and cellular degradation. It can also lead to fatigue and impaired sleep, which boosts stress, injury risks, and generally makes people more irritable. 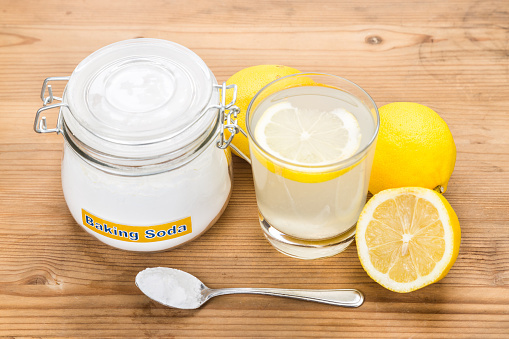 Baking soda and lemon water are both alkaline, which can help maintain a healthy pH balance. A good pH balance is around 7.35, with the most acidic pH being 1 and the most alkaline being 14. Some examples where acidity plays a role is when the hair and skin is dry or damaged, you experience a urinary tract infection, or suffer from heartburn. But sometimes you can’t feel the effects of high acidity, and it can impact how your body absorbs nutrients, thus limiting its ability to function optimally. As long as you stay hydrated and drink enough water every day (the equivalent of at least eight cups if you’re not living an active lifestyle), adding lemon to your water may help remove waste and toxins. Soaking in a bath of sodium bicarbonate can help relieve a UTI by neutralizing the pH balance in the affected area on a topical level. Drinking lemon juice may also help, as there is some evidence that it can help change the pH balance in the blood to limit the lifespan of harmful bacteria. Lemon is a great source of vitamin C, which is a powerful water-soluble antioxidant. It helps maintain cellular integrity and fights against the detrimental effects of free radicals that can cause damage and infection to your cells. One of the biggest benefits of the lemon is its effect on your liver. Your liver is responsible for acting as your body’s filtration system, meaning it processes nutrients and it moves out the waste and toxins. There is an old saying that goes, “Your body goes as your liver goes,” and I believe that statement to be entirely true. Lemon can help boost enzyme production in the liver, more so than any other food. It can aid in nutrient absorption, waste removal, and improved health. Heartburn causes discomfort for millions of Americans. Sodium bicarbonate is a common ingredient in most antacids, but it can also be taken on its own to soothe and neutralize stomach acid. It can be used as an effective treatment for heartburn, ulcer pain, and indigestion. Take half a teaspoon in a half-glass of water every two hours to neutralize acidity, but no more than seven servings in a 24-hour period. If you’re over 60, cut that to three servings per 24-hour period. There are studies underway that are looking at the effects of baking soda on breast cancer patients. For one, it has been found to have a neutralizing effect on tumors in mice. When combined with the antioxidant and antimicrobial effects of vitamin C and limonoids, it’s easy to see why people think baking soda and lemon water can be an effective form of cancer treatment— but further studies need to be conducted. I do believe there are benefits to drinking lemon water, as well as baking soda and lemon water drinks. Having a glass of lemon water in the morning and throughout the day can help maintain one’s alkalinity and improve nutrient absorption while adding some flavor to an otherwise boring beverage. Sometimes I just like to put fresh lemon slices in an infuser water pitcher, while others might like to squeeze fresh lemon juice into their glasses. Whichever method you prefer should offer the same benefit. Hasegawa, S., “Biochemistry of Citrus Limonoids and Their Anticarcinogenic Activity,” Food Phytochemicals for Cancer Prevention, 2009; doi: 10.1021/bk-1994-0546.ch015. Cancer Research, 2009; 69(6): 2260-8. Robey, I.F., “Bicarbonate and dichloroacetate: Evaluating pH altering therapies in a mouse model for metastatic breast cancer,” BMC Cancer, 2011; doi: 10.1186/1471-2407-11-235. Dioso, F., “Lemon Juice Liver Cleanse,” Livestrong web site, last updated June 23, 2015; http://www.livestrong.com/article/137433-lemon-juice-liver-cleanse/, last accessed September 29, 2015. “Sodium Bicarbonate,” U.S. National Library of Medicine web site; https://www.nlm.nih.gov/medlineplus/druginfo/meds/a682001.html, last accessed September 29, 2015.